Obsessive media focus on President Trump’s personal indecencies undoubtedly contributes to important news stories not seeing the light of day. In that regard, it’s no wonder the US public is generally unaware of US military interventions in parts of the world, particularly in Latin America. That way, US imperial excess gets a pass. 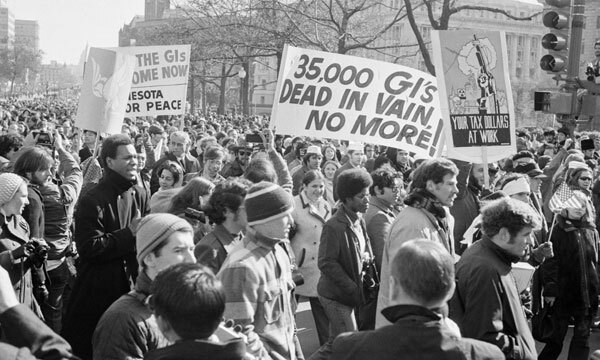 Anti-war sentiment in the US during the Vietnam war. On July 12, a Hercules C-130 US military transport plane landed at a military base near Buenos Aires with at least eight US Special Forces troops on board, along with “arms, explosives, and head gear.” They will be preparing 40 police officers from Argentina’s “Special Group for Federal Operations” to take charge of security for a two-day meeting of the G-20 group of wealthy nations set for Buenos Aires beginning on November 30. Argentina and Brazil are the only Latin American members of the G-20 group. The US government will pay most of the US$1.5 million cost of the training project. The US soldiers belong to the “Special Operations Command” of the US Southern Command. They’ll be in the country until August 3. As acolytes of the market economy and expropriators of natural resources, the two nations enjoy an affinity, which is oxygen for a US project underway now in Neuquén. That southwestern city of 340,000 people is the largest in Argentina’s Patagonia region. According to Buenos Aires’s Clarín newspaper, “Global investment in the unique [Vaca Muerta] deposits will exceed US$100 billion in equipment and structures over the next 10 years. US companies will be providing most of that money.” It’s by no means accidental, therefore, that a US base is being constructed in such a place, and in an area too, one adds, with large aquifers of fresh water. The base will cost US$2 million. US embassy spokespersons say American troops will be helping out with natural disasters. Provincial officials, however, identify the installation as a “military base.” The Southern Command was to have established a base in Neuquén in 2012, but held off in the face of protests against a base proposed for Chaco province. Other US bases are on the way in Argentina. One in Misiones, in the North near the “Triple Border” with Brazil and Paraguay, is programmed to combat narco-trafficking and terrorism. Another will be in Ushuaia in Tierra del Fuego. Scientific purposes are spoken of. There’s a proposal for yet another in Jujuy province, in the country’s extreme northwest where massive deposits of lithium are located. Very likely the role of US bases, at least in Latin America, is to make real the US concept of mobilising national alliances to serve US purposes. That strategy was evident at a gathering of regional military forces in November 2017 at Tabatinga, Brazil, near the convergence of three nations’ borders. Speculation at the time had it that the training exercises were directed toward possible military action against Venezuela. Possible scenarios for Neuquén include these: a political movement cropping up in neighbouring Chile led by a latter-day Salvador Allende, Indigenous rebellions nearby or across borders, and oil-worker unionists taking on old ideas of national independence and regional solidarity. The potential exists for violent confrontations. Eventually, perhaps, the reasons why local activists, bystanders, and minders of corporate interests might die in such circumstances will be unacceptable in the United States. The US citizenry, hardly anti-imperialist, might lose heart at the deaths of loved ones in the Argentine Pampas. Someday they may even reject their civilisation’s addiction, no matter the toll, to fossil fuels as drivers of production.